Our skillful and talented execution combined with sincere effort and intelligent direction has placed NYC Smile Design in a position to be able to take advantage of the many advances in dentistry. The Waterlase® MD features an all-new MD laser technology platform that heralds the next generation of dentistry with superior clinical outcomes and a more pleasant patient experience for many dental procedures. The Waterlase® MD incorporates an extraordinary set of innovative new features, as well as many new features requested by laser owners from around the world. Heat and vibration are the causes of most of the pain associated with the drill. Since cutting the tooth with Waterlase® MD technology does not cause heat or vibration, Most dental procedures can be performed with no pain, virtually eliminating the need for anesthesia in most cases. Removes decay very precisely which allows you to keep a healthy tooth structure and have healthier teeth longer. Effectively performs numerous soft tissue (gums) procedures with little or no bleeding and gives your dentist a new high-tech tool for many procedures that previously required referral to a specialist. Now you can have them performed during your scheduled appointment. Avoids many common problems of the high speed drill, including cracks in the teeth from the vibration and rapid turning of the drill burrs which can weaken your teeth, creating future problems. The Waterlase®MD decontaminates as it cuts reducing the chance for bacterial contamination. 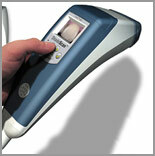 The 940nm ezlase™ soft tissue diode laser from BIOLASE. The new 940 nm ezlase™ diode laser delivers the best clinical characteristics of 810 nm and 980 nm diode lasers in one state-of-the-art system. 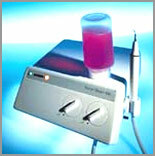 Until recently, soft-tissue dental diode lasers used one of two wavelengths: 810 nm or 980 nm. The older wavelengths, 810nm and 980nm were selected by laser manufacturers because of their commercial availability and energy absorption characteristics in soft tissue. An analysis of the wavelength absorption chart shows that the new 940 nm wavelength can provide great hemostasis during soft tissue procedures because of its position on the absorption peaks of Hb and HbO2 while being slightly off the absorption peak of H2O. In addition, clinical use by experienced diode laser users are indicating that the new ComfortPulse™, pulse characteristics are more comfortable for patients. This research led BIOLASE Technology, to develop the ezlase™, the first dental laser to obtain clearance at this unique 940 nm wavelength. One of the biggest problems in dentistry is dental unit waterlines biofilm (layers of microorganisms that accumulate within water lines). We are one of the few offices in the nation to provide disinfected water in our dental operatories. 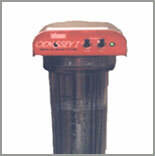 Odyssey I generates ozone from oxygen through exposure to ultraviolet light. In less than ten minutes the ozonated gas sterilizes the distilled water in the reservoir. As it passes through the lines it destroys biofilm. It has been shown the amount of bacteria in dental waterlines to be greater than 1,000,000 CFU/mL. With Odyssey I that amount is reduced to 10 CFU/mL. This is well below the 500 CFU/mL acceptable levels in potable water. Because your health and safety are always our first concern, for those patients who require monitoring due to health issues or for patients having sleep dentistry we use a unique and comfortable technology for pulse recognition, blood pressure readings and pulse oximetry. The monitor we use has the ability to spot check or continuously monitor critical parameters with audible and visual alarms that provide instant notification. Information can be printed and kept on file in a patient's chart. Inhalation sedation using nitrous oxide has been proven to be a safe and effective drug for more than 150 years. Within 3-5 minutes the effects of sedation can be seen. 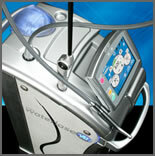 Rapid and complete recovery occurs within minutes of nitrous oxide termination. The equipment we use is high quality and state of the art. Our machine allows us to give an exact amount of nitrous oxide needed to relax a patient, and can be given in incremental doses. 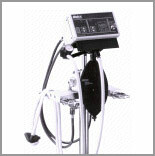 The machine contains a pin-index and diameter-index safety system to ensure proper attachment and flow of gases to the patient. The Zoom! in-office whitening system is a revolutionary tooth whitening procedure. We use the Zoom! Light because it generates minimal heat, the usual source of discomfort with other in-office bleaching systems. It's safe, effective and very fast. In just over an hour, your teeth will be dramatically whiter. In many cases 6-9 shades lighter. The expertise of the cosmetic dentist can be limited by the technician who crafts and manipulates the porcelain restoration. Skillful artistry and scientific understanding of porcelain is very important. After lengthy interviews and an exhaustive international search we developed a partnership with a highly talented and exclusive group of Japanese artisans. Japanese ceramists are world-renowned for their craftsmanship. Because they are committed to producing the finest dental restorations, their lab is outfitted with the latest technology and materials. The benefit of such a relationship includes a faster case turn around time and a more customized and natural looking smile. Our lab understands how we evaluate the entire face, skin tone, hair color and personality of our patient to make the teeth complement and enhance these individual features. Along with our desire to produce excellent dentistry comes the need to be able to see what we are doing more clearly. Without a doubt, the most important vision enhancement aid is a pair of high quality magnification loupes. When you see a magnified image of a tooth through a pair of loupes, your ability to render precision care rises tremendously. We believe magnification should be the standard of quality care. 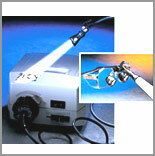 Orascoptic Research leads the way in its commitment to developing innovative magnification and illumination. In light of the new techniques being used in dentistry, a high level of precision is paramount. With the new prismatic magnification from Orascoptic 4.8X power with wide fields of view is possible. We find this to be indispensable in our office. Using a headlight is just another step beyond loupes. Headlights eliminate most shadows, since your head can never get between the source of the light and the tooth being illuminated. This technology provides fewer traumas to the tooth and its very quiet compared to conventional drills that use air turbines. Kavo Electrotorque simply makes precision in preparation easier to achieve. It provides outstanding tactile response and optimal control. This Kavo electric motor is far and above the finest hand piece we have ever used. Among the newest technologies we have introduced in our office is a small laser instrument called the Diagnodent, which scans the teeth with harmless laser light searching for hidden cavities. 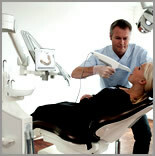 Diagnodent helps us detect cavities at the earliest possible stage. Locating hidden decay before it destroys tooth structure is one of the biggest problems in dentistry. Prior to widespread use of fluoride, decay of teeth was easily detected since it destroyed a big chunk of tooth. Fluoride has made tooth surfaces harder. However disease process can start through microscopic defects in hard surface enamel and readily spread into softer tooth structure beneath. This makes conventional means of detecting cavities with X-rays and probing with hand instruments simply unreliable. 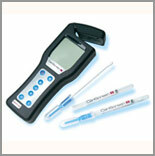 Diagnodent pen like probe simply glides over tooth surfaces, constantly checking for health of the tooth. A number scale and alarm signals for dental decay. This technology is completely safe and pain-free. Computer Guided Implant Surgery SIM/Plant is the biggest single advance in implant treatment planning. 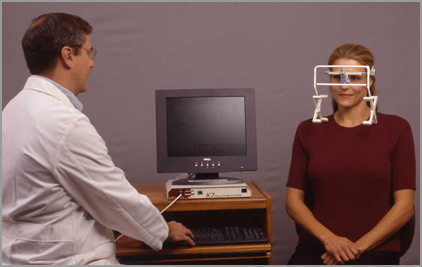 It is an interactive 3D computer imaging system that guides us in implant surgery. With SIM/Plant we can visualize the placement of simulated implants and it gives us detailed knowledge of the anatomy of the jaw in all three dimensions. It helps us locate important internal structures and also helps us measure bone quality directly from images. As implant surgeosn and restorative dentists, we find SIM/Plant a necessity, not an option. 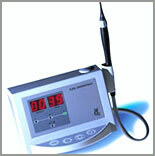 We use a state of the art ultrasonic teeth-cleaning instrument called the Piezon Master 400. This instrument is one of precision and quality, transferring ultrasonic energy in a pleasingly consistent and controlled manner for the removal of tarter and plaque. It allows us to deliver irrigant or antimicrobials at a warm soothing temperature for greater patient comfort. The bacteria in the loose plaque cannot resist the ultrasonic vibrations of 32,000 Hz. Therefore these disease-causing bacteria are swept up and eliminated in seconds. 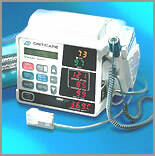 This instrument creates less heat and aerosol than conventional cavitron units do for greater patient comfort. It doesn't feel like a syringe. We know that some patients get more nervous than others at the mere site of a needle and syringe. That's why this office performs injections with a revolutionary system called the Wand, a computer controlled local anesthetic injection system. The microprocessor inside the Wand automatically ensures a steady flow rate regardless of tissue density. The flow of anesthetic into your tissue is the source of discomfort for most injections-not the needle. The Wand delivers anesthetic with an optimal, constant, slow flow to achieve a comfortable and virtually painless injection. The computer also provides a flow of anesthetic ahead of the needle, a pathway of anesthesia, so you hardly feel the needle at all. The Caries Risk Test (CRT) is a simple test of the patient's saliva performed in the office to measure the concentration of the Streptococcus Mutan and Lactobacillus Bacteria present in a patient's mouth and the salivary flow rate of the patient. It is used in conjunction with the clinical examination as well as past caries history, changes in the patient's diet (increased intake of fermentable sugars) and changes in medication. These two bacteria have been implicated in the cause of dental decay and various studies have confirmed a correlation between the bacteria levels in plaque and saliva. High bacterial levels indicate a patient is at risk for dental caries, but it does not necessarily mean that you will develop cavities because there are a variety of factors that can counter the effects of high bacterial counts. These include: fluoride exposure, high saliva flow, frequency of tooth brushing and the presence of protective sealants. However, if high bacterial levels are found it is necessary for the dental team to take corrective action and to monitor the patient more closely. This would include fluoride products, sealants placed in pits and fissures where bacteria tend to flourish, diet counseling and in low saliva flow conditions that are contributing to high bacterial levels, saliva substitutes or changes in medication may be suggested. Since caries risk changes with stress, diet, medication, illness, saliva flow and pregnancy, periodic measuring should occur as part of the dental exam. The best prevention is to assess the patient's bacterial levels and salivary flow rate prior to the patient developing caries. Drs. Tabib and Mello have not used filling material containing mercury (commonly called amalgam or silver amalgam) since 1998. There are people who feel mercury can contribute to health problems. From a dental point of view, mercury fillings expand and contract with temperature changes (hot and cold liquids and foods). Over time, this constant expansion and contraction will cause teeth that are filled with this material to finally break. When preparing teeth to receive a restoration bonded (tooth colored) materials require fewer teeth to be removed than when preparing a tooth to receive an amalgam. Because of adhesive properties, a bonded restoration is able to retain the majority of a tooth's strength. Conversely, an amalgam restoration greatly weakens a tooth's strength. Drs. Tabib and Mello are educated in the proper way to remove amalgam in a healthy way. All procedures are done under a rubber dam isolation, which creates an area to do the procedure similar to a surgical isolation. This prevents inhalation of the amalgam particles as they are being removed as well as prevents bacteria present in saliva from entering the cavity preparation. The success of restorations cases hinges on numerous factors. One of the main obstacles is communication with the ceramist. Relaying the desires of our patients to our ceramist can often be a difficult task. Communicating nuances of color,translucency,shape and micro anatomy of teeth can only be achieved with proper knowledge and superior photography skills. Digital photography with the best professional camera allows the next best thing to having the ceramist right there with us. Instead of interpreting a shade map, the ceramist will have an exact representation of the colors, texture and anatomy. An update to the tremendously popular EOS-1Ds, the EOS-1Ds Mark II is a must have in our office. With a full frame 16.7 megapixel CMOS image sensor, combined with Canon's DIGIC II Image Processor, the EOS-1Ds Mark II has dramatically decreased startup and card-writing times in comparison to the EOS-1Ds. Our patients have realized many benefits since we computerized and networked our treatment rooms. Each treatment room is computerized and networked with each other. All intraoral and extraoral photography, DIFOTI images, patient records, written communication and clinical information can be shared between the Doctors and treatment areas instantly from anywhere in the office. Immediate access to the Internet with our DSL hookup. E-mail with the restoratives labs to achieve better cosmetic results for our patients. Imaging allows us to create a new smile for patients without ever touching your mouth. We find it to be a great tool in improving communication and education with our patients because it gives the patient an opportunity to participate in creating their own smile. Imaging can also prevent unrealistic expectations with the final result. We also use imaging to improve our communication with our restorative labs. We create what we want and send this to our lab with our prescription, leading to more predictable and esthetic results and patient satisfaction. This is all done through the magic of a computer, color monitor, our camera and our specialized software. We basically take a still photo of the patient and save it on the screen using the computer. We then create simulated procedures on the computer including closing spaces, repairing fractured teeth, veneers, crowning, bleaching, recontouring, and orthodontic and tooth lengthening. We can even correct a gummy smile to show what you would look like with that procedure done. One of the most difficult tasks for any dentist is being able to view cavities in between teeth. Visual analysis of dental X-rays is difficult (because the human eye tends to smooth out density gradients). 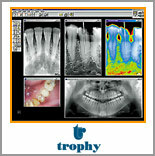 Dental x-ray images are highly variable (due to film type, exposure level, tooth structure and shape). According to a study done by the UCLA School of dentistry, the presence of cavities and their depth is misdiagnosed up to 40% of the time and healthy teeth are misdiagnosed up to 20% of the time. 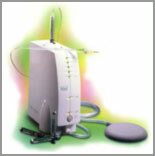 Logicon caries detector uses algorithms based on laboratory data to automatically outline lesions on tooth image directly on the computer. 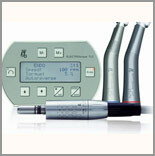 In another study conducted at UCLA 608 teeth were analyzed by Logicon Caries detector and and by 18 dentists. The results proved that Logicon outperformed humans on cavity detection. We feel extremely privileged to be able to offer this service to our patients and it fits extremely well with our philosophy of prevention. The latest advancement in dental technology uses a computer and low-radiation X-ray to produce X-ray images directly onto a computer screen! With sophisticated software, the computer-generated X-ray can reveal information not previously available from a conventional X-ray machine. X-rays taken by the Trophy RGB X-Ray can be colorized, magnified and computer-enhanced to indicate things such as bone density! Although every patient can benefit from the 90% DECREASE in radiation exposure, the digital X-ray machine offers special benefits to dental implant patients. With the "instant" development time of the computer and the ability to view an enlarged X-ray on a computer screen at the patients' chairside, Dr. Tabib has the ability to make sure the patient's nerves and sinuses are protected and the implants are properly seated by taking digital X-rays at various points during the procedure! Added patient safety, more predictable treatment, much lower X-ray radiation, and instant feedback clearly make the digital X-ray machine the X-ray technology of the future. Objective and consistent shade measurement of teeth. Monitor bleaching of teeth by color mapping shade changes. We take many precautions to keep our office clean and sanitary for your safety. In the past few years studies have brought to light the fact that water lines necessary for many of the dental instruments can be contaminated with tens of thousands of microorganisms. Because of the structure of the narrow tubes and the way dental units are made, biofilm (a thin layer of bacterial slime that coats the inside of the dental tubing) is able to form inside the lines or tubing. When treating our patients with the dental equipment, these bacteria become airborne in tiny droplets and are constantly being inhaled. Most of these bacteria are harmless. But in the interest of your safety and the safety of our dental team we are taking some special steps to alleviate any potential problems. 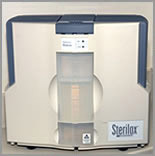 In response we have adopted the Sterilox water treatment system. Sterilox provides our office with a safe, fast, effective and ongoing solution for the removal of biofilm and microorganisms. The solution is a non-toxic, tasteless odorless antimicrobial germicide that you will not notice but will keep our water lines and the air we breathe safe. For years, dental occlusion has been largely a matter of guesswork for dentists. 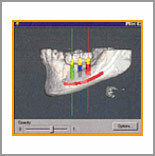 Tekscan has developed technology, which provides data to evaluate the intricate inter-relationship of how teeth meet. In clinical situation it is extremely difficult to determine the order of tooth contact or the force contained within them. 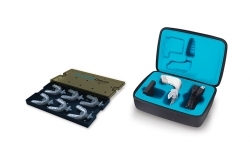 The T-scan III system occlusal analysis system quickly and precisely determines the amount of force generated and premature contact points for predictable occlusal control during adjustment procedure. Tooth decay is mainly caused by a bacterial infection on the teeth. The CariFree system allows us to test for and treat the bacterial infection before it causes tooth decay. CariFree employs advanced infection testing and treatment technology to promote long term dental health, instead of simply treating symptoms. How is it possible? The advanced CariFree system measures the magnitude of harmful bacteria on your teeth. If harmful decay-causing bacteria are identified, the CariFree treatment plan will be prescribed. The CariFree system was specifically developed to embrace the new science of testing for and treating dental bacterial infection. Here is how the CariFree System works: The quick and easy CariScreen test determines your level of decay-causing bacteria. It takes only one minute to determine if you are at a low, moderate, or high risk of developing cavities in the future. Since risk factors change over time, it is recommended that CariScreen test be taken once per year. For the most accurate test results, do not eat or brush your teeth for at least one hour prior to the test. 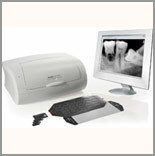 Based on computed radiography (CR), also referred to as phosphor storage plate (PSP) technology, the flexible KODAK CR 7400 System delivers a full range of intraoral and extraoral images digitally, eliminating the need for traditional film processing. The design and operating principles of the Planmeca Cone Beam maxillofacial X-ray unit are based on the latest scientific research and clinical insight of the requirements of today's maxillofacial radiology. 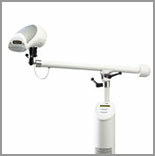 Planmeca Cone Beam combines several imaging modalities into one intelligent X-ray unit. Panoramic radiography for general diagnostics of the tooth arch and the jaw. Advanced panoramic radiography for specific diagnostics of the tooth arch, the jaw, maxillary sinuses and temporo-mandibular joints. Dental tomographic slices for detailed morphologic diagnostics of facial bones. Cephalometry for imaging of the skull. Transtomography® is a new digital imaging system developed by Planmeca. Transtomography® uses multiple sweep method whereas the linear tomography uses one sweep. Transtomography® combines the translation movement with an oscillation movement where the center of the rotation moves over the region of intrest. The layer thickness can be adjusted like in film based linear tomography. Due to the developed imaging method, the image of the anatomies are truthful and information maximized. Multiple sensors in an extremely light weight (four ounce) spectacle-like array, track the motion of a tiny magnet attached to the lower incisal gingiva with adhesive material. The configuration is totally non-invasive and, unlike clutches, does not interfere with patient function. The opposing sensors are wide apart permitting unobstructed access to the oral cavity for taking bite registrations and other clinical procedures, and the system is virtually immune from effects of slight head motion or nearby metallic or electronic interference. A patient education mode is included to simplify patient understanding and staff training. Utilizing high quality bipolar surface electrodes, surface EMG data can be taken from up to eight muscle sites simultaneously and in real time. The program permits taking electromyography data either at rest or in function. All eight channels may be displayed simultaneously, for a period of 15 seconds (one visual screen width). The K7/EMG signal processing circuitry provides unsurpassed protection against system noise or motion artifact. The patient education mode permits quick and easy patient education as to status of masticatory muscles. These scans provide an objective measurement of masticatory muscle electrical activity which accurately represents their physiologic state. 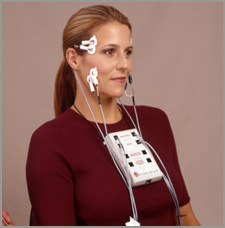 TMJ Vibration (Sound) Evaluation System. A lightweight headset holds highly sensitive vibration transducers over each TM joint, enabling simultaneous, bilateral capture of tissue vibrations emanating from joint sounds. Vibration (sound) data is correlated to vertical dimension of opening and closing, providing clinicians with valuable information to aid in assessing the status of articular disk and joint function. The ESG includes the ability to document TM joint status through recording joint sound vibrations – simply and non-invasively. The battery operated J5 Myomonitor TENS unit, like its predecessor the J4, delivers controlled, periodic, bilateral electrical stimulation to help provide muscle relaxation, increased blood circulation and increased range of motion. The J5 Myomonitor TENS unit is the latest in a succession of Myotronics products with a history of over thirty-five years of clinical effectiveness. 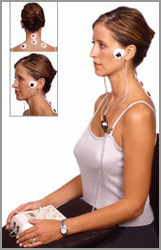 It is known that cervical muscles play a significant role in head posture and consequently may impact occlusion. For years many dentists have stimulated these cervical muscles to relax them as part of the overall diagnosis and treatment process. 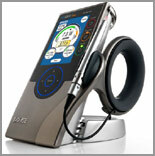 The J5 Myomonitor TENS unit provides four patient stimulation channels, each left and right pair with its own controls. Now, with the ability to stimulate four muscle sites simultaneously, the J5 helps improve treatment efficacy while saving time for doctor and patient. Two channels may be turned off when not required. Like its forerunners, it is the only true simultaneous 4 channel bi-lateral stimulator of its kind. It incorporates unique, fail-safe circuitry. A valuable tool in office procedures for occlusal adjustment and in bite registration, it is also useful in the treatment of some types of TMD dysfunction and associated pain. In our office, we are committed to not only transform our patient’s smiles, but to provide them with an environment that is clean and healthy. We believe that clean air is essential for better health. In our office we have installed a stand-alone IQAir purifier system that protecting our patients from harmful pollution particles. Our dental IQAir is just one more way to foster our commitment to always offer the best quality service to our patients. Our IQAir purifier helps to eliminate any bacteria, viruses, odors from disinfectants and office chemicals, mercury vapors and volatile compounds in the air. For over 34 years, Crystalmark Incorporated has developed and refined the air abrasion process for the aerospace, semiconductor and other high technology disciplines. We bring all that experience to bear in the dental profession. 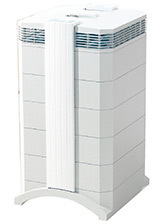 The highly evolved CrystalAir ™ system gives a higher level of control for a wider range of treatment scenarios. With experience in other extremely demanding industries allowed Crystal mark us to manufacture a system that is technologically superior and a greater value than that of the competition. The most important attribute is the modality's capacity that allows for painless, anesthetic-free treatment of most incipient to moderate cavity preparations. Air abrasion also eliminates the noise, heat, smell and vibration of the dental handpiece. Now you can enjoy more precise dentistry with more options than ever before. The air abrasion system combines a finely controlled high pressure air stream with a highly adjustable 27micron aluminum oxide powder flow. We have designed our system with the demanding clinician in mind. The Cinema ProMED System is a patient entertainment system powered by ZEISS Cinemizer OLED multimedia viewing glasses. Cinemizer ProMED systems helps reduce anxiety by completely removing patients from the clinical setting and immersing in a video experience. Minimizer OLED multimedia video glasses simulate a 40-inch screen and Sony headphones provide sound. The glasses use binocular 3D and LED technology and have individual focus adjustments for each eye. The Cinemizer OLED is compatible with 4th-generation iPods and iPhones and HDMI-compatible devices. Cinema ProMED System was evaluated by 12 consultants in 117 uses. 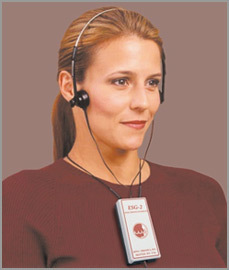 This patient entertainment system received a 90% clinical rating. We have introduced the TRIOS 3Shape digital impression technique which eliminates messy impressioning techniques of the past. No more trays to fit in the mouth and messy goopy material that can make you gag. With this new digital scanning we can provide fast and accurate impressions that ultimately provides superior crowns and veneer restorations. AcceleDent Aura's SoftPulse Technology releases a safe and effective light force pulse that transmits through the roots of your teeth to the surrounding bone socket. This helps accelerate the cellular response and speeds the rate with which your teeth can move. When used in conjunction with orthodontics, AcceleDent Aura has been clinically proven to move teeth up to 50% faster.